As I sat through the Celebration of Life Service for Chad Carr, I couldn’t stop looking at the picture above which was on the cover of the program. First I saw a little boy, barefoot, walking away with purpose. Chad had heroically battled Diffuse Intrinsic Pontine Glioma, (DIPG), for 15 months before going home to God. One hope was born 15 months ago when Chad’s Dad Jason, Mother Tammi, and brothers CJ and Tommy started “Chad Tough Foundation” to support pediatric brain tumor research. Jason is a past quarterback at the University of Michigan and the son of Lloyd Carr, the University of Michigan Hall of Fame football coach, which provided a national platform to help ChadTough raise hundreds of thousands of dollars for the hope that there will soon be a cure for pediatric brain tumors. But what kept drawing me back to the picture was the lion seeming to lead Chad to heaven. I immediately thought of Aslan the Lion King from The Chronicles of Narnia: The Lion, The Witch, and the Wardrobe, one of C.S. Lewis’s children’s books written to help people understand the truth of the Gospel of Jesus Christ. In the book one of the characters, Edmund betrays his brother and sisters to the White Witch. The White Witch, according to the laws of the Deep Magic had the right to sacrifice Edmund because he was a traitor. When Aslan heard of Edmund’s betrayal, he agreed to be sacrificed in Edmunds place so that Edmund’s life would be spared. As the story goes, because Aslan was an innocent victim, the laws of the Deeper Magic dictated that he would be resurrected. In the Chronicles of Narnia, Aslan the lion was a “type” of Christ. Jesus is both the Lamb of God and the Lion of the tribe of Judah. In the gospel of John 1:29, when John the Baptist saw Jesus coming to him he said, “Behold the Lamb of God who takes away the sin of the world!” From Old Testament times until Jesus was crucified, a lamb was used as a sacrifice during Passover, so the Jews were very familiar with the sacrifice of a lamb to temporarily cover their sins. They understood that, “without shedding of blood there is no forgiveness.” (Hebrews 9:22b) Jesus as the Lamb of God offered one sacrifice for sin for all time by being crucified on the cross. A story titled, “The Brave Little Soul” written by John Alessi, was on the back side of the Celebration of Life program. In the story the little soul asks God, ‘Why do bad things happen, why is there suffering in the world?” “God paused for a moment and replied, ‘Little soul, do not be sad, for the suffering you see, unlocks the love in people’s hearts.’ The little soul was confused. ‘What do you mean’, he asked. God replied, ‘Have you not noticed the goodness and love that is the offspring of that suffering? Look at how people come together, drop their differences, and show their love and compassion for those who suffer. All their other motivations disappear and they become motivated by love alone.’ The story goes on and the little soul becomes very excited and says, ‘I am brave; let me go! I would like to go into this world and suffer so that I can unlock the goodness and love in people’s hearts! I want to create that miracle!’ God tells him he is a brave soul but that he will not be able to do this alone. The gist is that God uniquely provided Chad with such a loving father and mother and two loving brothers as well as his grandfather Lloyd and thousands of people supporting and bathing him in prayer to help him through this journey. But in the end, Chad traveled to heaven in the love and comfort of the Lion of Judah, Jesus, in faith and boldness. That was so evident in Chad’s Celebration of Life Service. But the story doesn’t end there. Support is still needed for the ChadTough Foundation with hope for a cure for pediatric brain tumors. You can donate through www.chadtough.org. Don’t let the hope of heaven pass out of your mind with the business of daily life. Chad’s struggle brought about so much love and support with a view to eternity. In the end, whether we are 5 years old or 95, we will all walk that final walk into eternity. The Carrs taught Chad all about Jesus and His love and grace. The song he sang so often was “Jesus loves me”. If you are a parent, don’t leave the teaching of the Gospel of Christ to chance. First make sure all is well with your soul in faith and hope in Jesus and then, as Deuteronomy 6:6-7 says, “And these words which I am commanding you today, shall be on your heart; and you shall teach them diligently to your sons and shall talk of them when you sit in your house and when you lie down and when you rise up.” Jesus offers so much love, joy, comfort, and peace here on earth and He offers true eternal hope in a hopeless world. 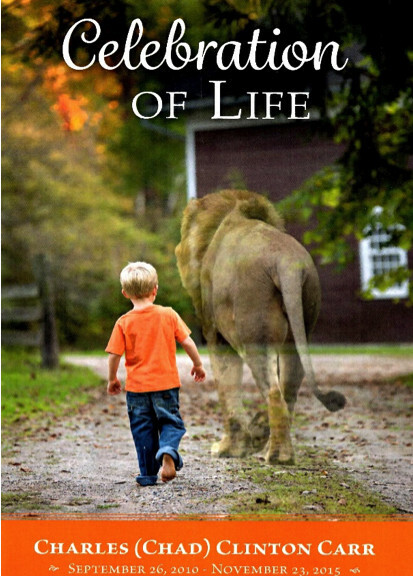 In the last book of the Chronicles of Narnia series, The Last Battle, King Tirian says, “But courage, child: we are all between the paws of the true Aslan.”(Jesus Christ) I believe that is where Chad is. As a Christian, that is our comfort and our hope. Note: If you are not sure of the Gospel here are a few Bible verses that may help you to understand the riches of His grace; John 1:12-13, John 3:16, Romans 3:23, 6:23, and 10:9-10, 1 Corinthians 15:1-4, Ephesians 2:8-10, and Philippians 2;1-8.